“I have been using your cryosurgery product, Verruca-Freeze® since it was first introduced to the veterinary market. At this point I have successfully treated hundreds of adenomas and similar small skin growths on both dogs and cats. I find your product to be very easy to use and subsequently very profitable.” –A. W. Broadbent, DVM, Brevard Animal Hospital, P.C. Verruca-Freeze® is a hand held aerosol canister that contains a proprietary, highly optimized formulation of refrigerated gases that medical professionals can use for cryosurgery and cryotherapy in an outpatient setting to freeze a lesion down to -70°C (-94°F). The packaging for Verruca-Freeze ® is designed for hand-held use, which makes it completely portable. CryoCones® can be placed over the lesion which creates a seal so that the lesion itself can be sprayed. CryoBuds® can be used like a swab to apply the cryogen. A 3-6 second spray, freezing for 20-40 seconds, makes it a quick, self-anesthetizing and easy procedure. Verruca-Freeze® canisters are specially packaged to ensure an indefinite shelf life (as long as properly stored), unlike competing products that have to be replaced monthly due to inferior packaging. Verruca-Freeze® is non flammable, non toxic, and environmentally friendly. Whether you run a busy dermatology practice, or treat the occasional skin lesion at your family practice, Verruca-Freeze® has just the kit or canister to fit your clinic’s needs. 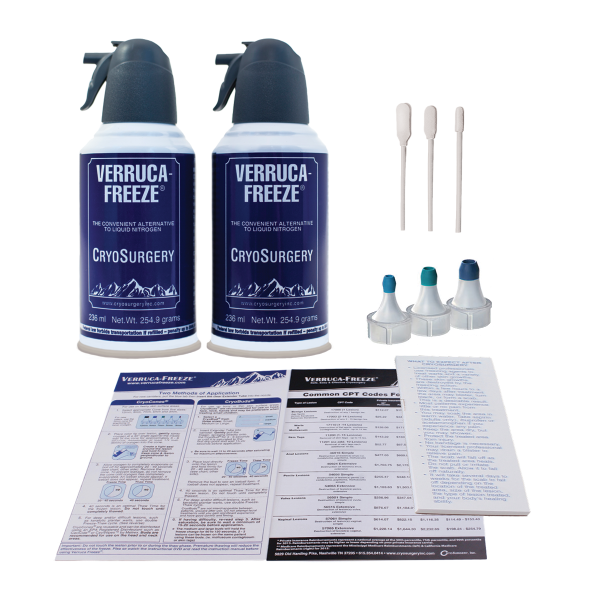 The Verruca-Freeze® family of products offers complete starter kits, as well as refill canisters available in small, medium, and large sizes. 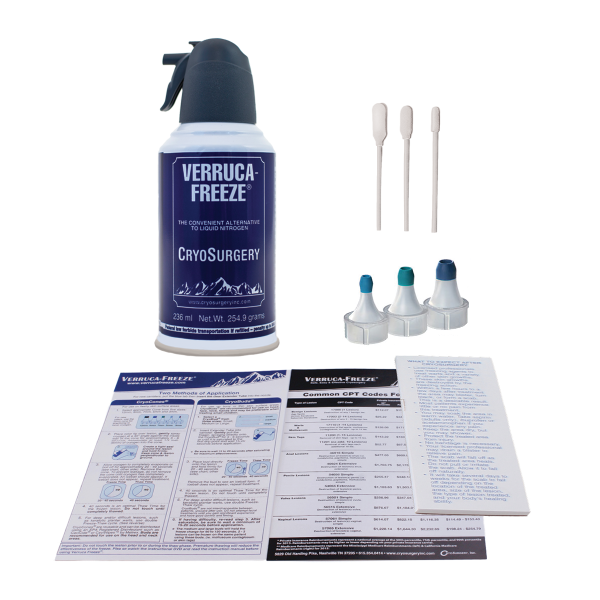 Visit our Products Page to see all the canisters, kits, and accessories Verruca-Freeze® offers. 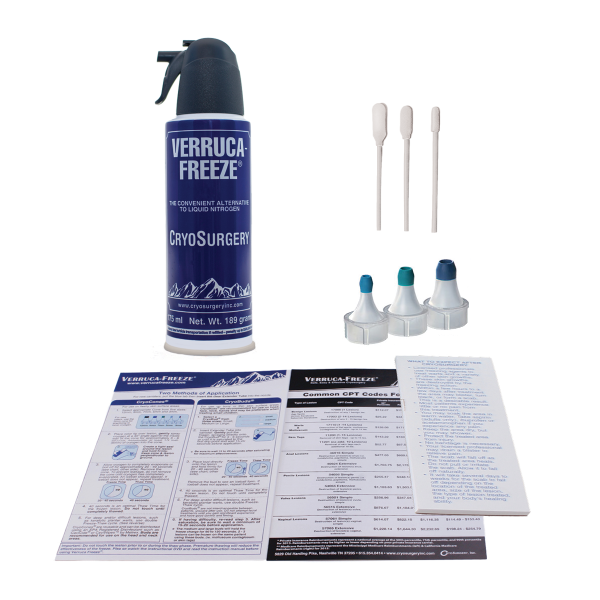 Kits include everything you need to get started, including your choice of canister size, a complete set of reusable CryoCones®, a pack of CryoBuds®, practice pad, an insulator for your canister, and many useful resources including “How To Use Verruca-Freeze®” materials and CPT codes for cryosurgery. For a complete look at the Verruca-Freeze® family of products, please visit our Compare Products Page. Current Users: If you are a high volume or bulk user, contact us at 615.354.0414 for a special product offering. Click Here to View Our Survey Offer for New Customers! ©2018 CryoSurgery, Inc. All rights reserved.